After having tested waters on the silver screen, film actors are now shifting their seat positions towards the Television! It was the legendary Big B, whose 'Kaun Banega Crorepati's success paved way to many filmstars who were fighting shy to embrace any show on TV. KBC's success not only revived the fortunes of Star TV but also of AB's sagging career graph! This was followed by a dud called Sawaal Dus Karod Ka, hosted by the Anupam Kher and Manisha Koirala, KBC (SRK in Season 3) and many others. The lure of TV seems to be not sparing anyone from Bollywood. 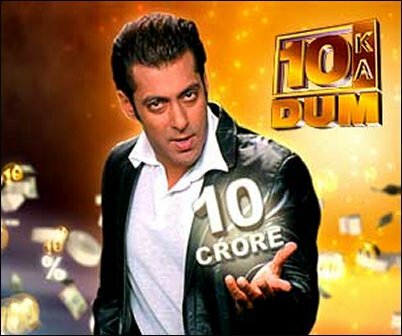 The latest one to be 'smitten' by the 'Idiot Box' bug is none other than our very own shirtless wonder- Salman Khan, who is all set to say 'Hello' to TV and has vowed to make people rich (read 'super-rich') with his show '10 Ka Dum', to be aired on Sony Entertainment Television (SET). If you think that becoming rich was that difficult, then, '10 Ka Dum' is all 'SET' to prove you wrong! The contestants here have to think like India, wherein they will have to answer a question, whose answer is an average percentage of a mass opinion poll conducted across India! If your guess matches with the cumulative opinion of India, then, you pocket a decent Rs 10,000 in your pocket! After that, every right or wrong question shifts your winning amount up and down by the power of ten, with the ultimate prize amount being a mammoth Rs 10 Crores! Meeting Salman Khan and becoming a 'Crorepati'? Now, that's a double treat.